Scheveningen: the most famous seaside resort in the Netherlands with a long sandy beach, an esplanade, a pier and a lighthouse. It's a district of The Hague which, contrary to popular belief, is not the capital of the Netherlands but is the seat of the Dutch parliament and home to the United Nation's International Court of Justice and the International Criminal Court. Between Scheveningen and The Hague's city centre is Madurodam, a miniature display of a Dutch city. For non-Dutch speakers the correct pronunciation of Scheveningen is nearly impossible. The phonetic pronunciation is "skhey-vuh ning-uh n" although that doesn't sound entirely right either! In World War II the Dutch used the pronunciation to distinguish between friend and enemy. The Germans were simply not able to get the first sounds right and started the word with "sh". This photo story, however, is not about Scheveningen in general, its history or tourist attractions, its restaurants, beautiful sights, entertainment or casino. It's about MY Scheveningen. The place I moved to almost 30 years ago after completing a Fulbright sponsored Masters in Law in Boston. The place where so many good things happened to me: my first real job as a lawyer, my first own apartment, my first few years of a reasonably care-free life, my first truly amazing dining experiences, getting married, hosting family and friends from all over the world and the birthplace of my first two children (two more to follow in the United States). It's not about beautiful Scheveningen but about the Scheveningen I remembered when I recently went back to visit - memories interwoven with feelings of nostalgia and longing! More about my Dutch life here www.marleenvandenneste.com/blog/a-quick-journey-through-holland and here www.marleenvandenneste.com/blog/a-small-glimpse-of-the-netherlands. Let me take you on the stroll I took one day last summer while I was visiting my family. The weather was, well, let's say, really Dutch: rain, wind, cloudy and not very warm and kept most people indoors. I started out at the beautiful dunes of Meijendel and crossed over to the beach passing many bunkers built by the Germans in World War II. Photo edit by Jim Colton. Walking on I looked for the nudist beach remembering the man wearing just a red wool sweater and nothing else, who walked there every single day, rain or shine, while I lived there. But the nudist beach was empty and I turned around at the sailboat area. Sailing is huge in the Netherlands. In fact (going to exaggerate a little) I learned to sail at about the same time I learned my multiplication tables! I went on to master windsurfing on a big, heavy, cumbersome board which made it easy not to fall off and to do some tricks like sitting on the edge while surfing, which I have been bragging about ever since. My children made me prove that I could do this a few years ago and much to my relief, I succeeded! Fully dressed! Continuing on the beach I stopped in front of the building where my first apartment was. Still looks the same: beautiful to me but very unattractive for everybody else. It's the yellowish building three down from the Pier and Kurhaus with the flag on the steeple. I cannot tell you how much time I spent on the beach, not really sunbathing, but using it as an extended office space working on legal documents or doing creative projects such as beading or painting hangers for the nursery! As I couldn't get in the building I ventured up another building and took this photo of the view I had from my apartment of the red roofs, tiny but well-kept gardens and the dunes. When I emigrated to the United States my law firm gave me a painting of these dunes. They also gave me a bicycle! Back to the beach I walked to the far end of Scheveningen with the harbors and the old fishing town. That's where I always did my Saturday morning shopping. I was glad to see that there were still family owned produce stores, butchers, bakeries, fish markets, brown cafés and little-hole-in-the-wall eateries. Errands were typically done by bike. And it's not a Dutch bike if there's not something hanging on it, be it a child seat or two, a cargo trailer or, in my case, a big wicker basket. The Dutch are very creative that way. There must be more bikes than people in this small country and bike traffic safety is one of the utmost priorities. There are special bike lanes everywhere with their own traffic signs and lights and there are bicycle parking lots where bikes are stacked in several levels. More about that here www.marleenvandenneste.com/blog/how-the-dutch-park-their-bicycles. Here I must go off-track a little. The pavements in the old town of Scheveningen are decorated with the coat of arms of Scheveningen: three herrings with a three-leaved yellow crown floating above the head. Herrings are big in Holland. The arrival of the Dutch herring in the port of Scheveningen is celebrated each year during the Flag Day. You ain't Dutch and you ain't much if you aren't among the first each year to eat these raw slippery, silvery creatures holding the fish by its tail, dipping it in onions and letting it slide into your mouth! It's THE traditional food in Holland and I know foreigners think it's the most disgusting thing ever! Back to my stroll and continuing through old town Scheveningen I made my way through the main street with its many bicycle stores to end up at the old lighthouse dating back to the 16th century and renovated in 1875. It's sitting amongst unattractive buildings and houses, hence only a photo of the bottom part. As time was running out and it got colder and wetter, I turned around and walked back through the busy streets of Scheveningen. I was tempted to take the tram just for old time's sake. Trams are everywhere and it's a challenge driving a car on, over and around their tracks. Public transportation is big in the Netherlands. People bike to the tram or bus, take a train and then walk to their destination. It's not uncommon to see people dressed to the nines in their suits, short skirts and beautiful Italian leather shoes or heels undertaking such a commute. 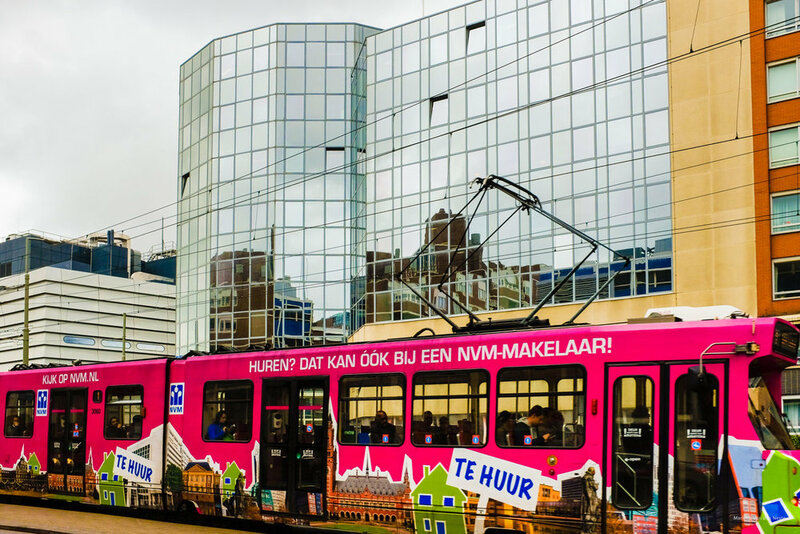 The photo below shows that Scheveningen is an eclectic site of old, new, dingy and tacky! On my way I stopped at the Kurhaus, an old beautiful, ornate building housing a hotel and several amazing restaurants. It is stunning inside with ceiling paintings by the Belgian artist Van Hoeck. While living in Scheveningen I attended many functions there and had dinner a few times at Kandinsky. I quickly walked in to feel the ambiance. Yes, it was still there! Back out and a few steps further I stopped to admire my old apartment building again. Yes, I know it's not a pretty sight but it was home! I had to go in to check out my old mailbox. Strangely enough I have many recurring dreams about that mailbox but standing there didn't help me figure out why. Almost at my car I was surprised to see this little jewel of a house still hidden amongst the unattractive buildings and houses. The reason I included this photo is to show the garden. No matter when, where, how and why: the Dutch know how to garden and large and small places alike always have some kind of landscaped garden done tastefully and colorfully. Flowers are big too and they are sold everywhere for peanuts! The Dutch have a saying, "Say it with flowers," and they give flowers to each other at any possible occasion. After I picked up my car I drove back to the harbor. I joined the little fisherman's wife watching over the sea and remembering the fishermen taken by the sea and spent some time with her in solitude and to do some soul-searching and reflecting. But that's for my diary and not for this blog. A cup of coffee in my very favorite, more than 100-year-old little restaurant (Weduwe Van der Toorn) was a very welcome stop. Several times a day fresh fish is delivered here straight from the boats so I had myself a plate full! The interior of the restaurant still looks exactly the same with its large mural depicting the fisherman's wife of the monument previously mentioned and her many adventures. One cannot be in Scheveningen without going to the most famous fish market in the Netherlands, "Vishandel Simonis," and purchasing some of its offerings. This is a grainy image of the market taken on another occasion with my mother in the red coat buying some of my favorites to take home.